An angry cop literally kidnaps a court proceeding in a desperate bid for justice in this made-for-cable drama. John Seda, as Eddie Rios (Selina) stands accused of the murder of two police officers, but he’s found not guilty due to a lack of proper evidence. 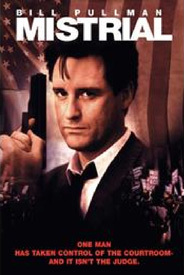 Bill Pullman as Steve Donohue (Independence Day), the detective who brought Rios in, is outraged by this decision, and in a burst of anger he pulls his gun and holds the defendant, the judge, and the jury hostage, demanding they immediately retry Rios, with Donohue presenting evidence he was forbidden to show the jury due to legal technicalities. Mistrial also stars Robert Loggia, Blair Underwood, and Roma Maffia.